Boppy Pillow Is A Must! What is it? This is a semi-circular pillow that wraps around your waist to allow an easy resting place for your baby while nursing and being held. How does it work? It wraps around your waist and you lay the baby down on it. Cool Features: The coolest feature aside from being awesome for nursing, are all of the different boppy pillow cases! 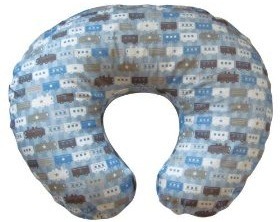 Environmental impact: This pillow can be used through the entire first year +. Practical Point: It will be uncomfortable for you to use this pillow right away if you come home after the birth looking 6 months pregnant still. Your bump will only get in the way and make it more difficult so try a flat sleeping pillow or a bundled blanket instead. $$$ Savings: Try making your own boppy cover or have a friend over to help you with it, this will allow for money savings and a neat unique cover! Do I recommend it? Absolutely YES! The boppy pillow is absolutely crucial when you have a newborn. The pillow can be used through nursing as well as an aid for your baby when he/she begins to sit up!